Happy Monday! I'm a little late in getting this up, but I had to finish making something for someone and get it in the mail today! I procrastinated a little too much. I'll post about it in a week or so! Anyways, It's my favorite time of year. Tulip time! 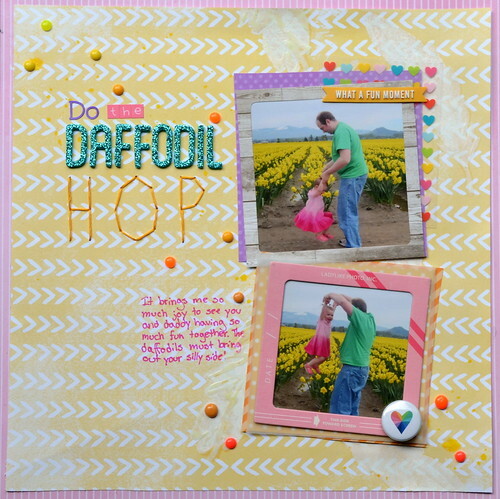 Ok, this layout is about daffodils, but I see daffodils every time I go see the tulip fields. While this layout is about the flowers from a few years back I did see the tulips again this year on Saturday. I took lots of photos and I'm just realizing now that I got a few very similar photos this year of my daughter and husband! Oh I can't wait to scrap them! 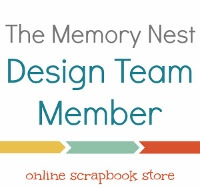 I made this layout for the Memory Nest's Sketch for make it Monday. I was very true to the sketch which doesn't happen all that often. 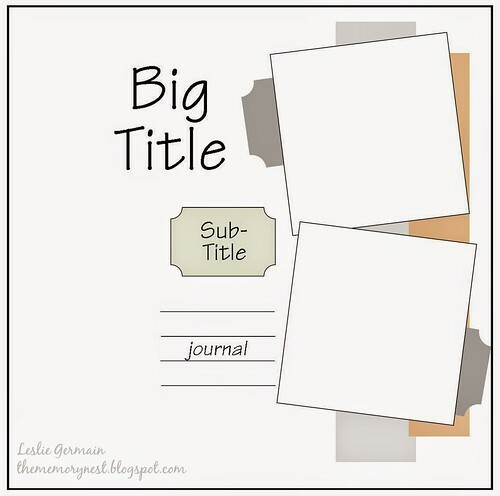 I had a few ideas for "big title," but they didn't work with the photos and space this time. Be on the lookout from some big titles in the future though! I made a bunch of cool paint and gel feathers in the background, but they mostly got covered by the photos, oh well. It was an experiment that worked fairly well so I'll have to try it again. I used my own enamel dots that I made on this layout. My dots came out great, but I just had them fall off my layout a few hours ago. I'll need some stronger adhesive. Bummer! Fabulous layout! LOVE the colors and your use of the homemade enamel dots. I LOVE seeing your tulip pictures!! I was watching HGTV and the family was moving to WA. They showed the tulips!! Plus your big title is great! !